The Race To Fish Slows Down. Why That's Good For Fish, Fishermen And Diners : The Salt Catch shares allot fishermen a portion of the catch in advance, in hopes of keeping them from racing each other to sea, sometimes in risky climes. They're controversial. They also work, a study finds. A fisherman in the Gulf of Mexico. Catch share programs allot fishermen a portion of the catch in advance, in hopes of keeping them from racing each other to sea, sometimes in risky weather. These programs are controversial. They also work, a new study finds. It doesn't take more than a few episodes of the Discovery Channel's Deadliest Catch to get the idea that commercial fishing can be a career path rife with risk, making it one of the most dangerous occupations in the U.S. Sometimes the danger stems from how fish are harvested. Rules for catching fish can vary by region and species. 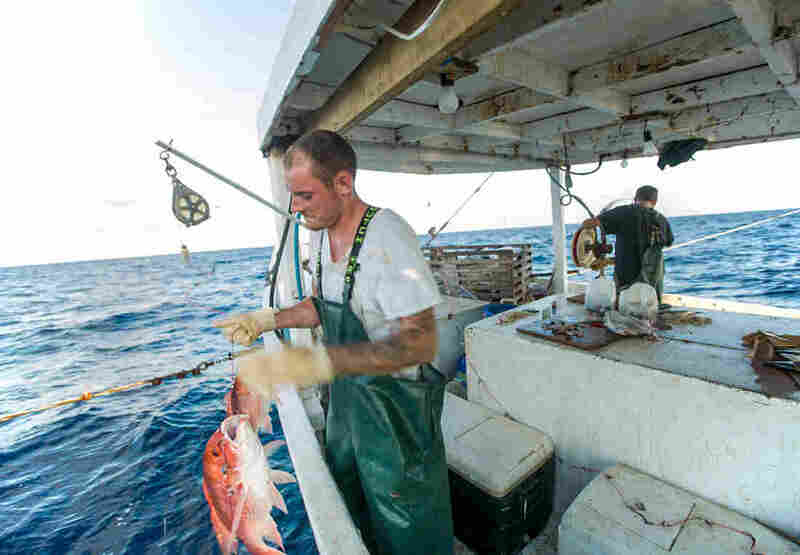 About a third of U.S. fisheries operate under what's known as derby-style fishing — a season opens for a few weeks or months, and fishermen race to land their catch before it's closed again. But derby-style fishing means commercial fishermen are sometimes forced onto the water in stormy weather or before their boats can be properly maintained. Miss the window to catch fish, and for some, it can mean the difference between keeping their businesses afloat or not. But over the last decade or so, a different kind of fisheries management program known as catch shares has been gaining ground. The idea here is to allot fishermen a portion of the catch ahead of time, and allow them to fish until they reach it. Proponents claim catch shares create incentives for fishers to slow down, eliminating the need to race each other to fish. A new study published online Wednesday in the journal Nature proves they're right. "This is the first time we see broad systematic evidence that catch shares are slowing the race to fish," says study co-author Martin Smith, professor of environmental economics at the Nicholas School of the Environment at Duke University. Researchers looked at monthly data from 39 federally managed commercial fisheries (worth a combined $402 million) such as Pacific halibut, Atlantic cod, New England haddock, Gulf of Mexico red snapper and more, which operate under catch share programs. The researchers then compared that to data from a similar control fishery that did not operate under a catch share program. They found that under a catch share program, harvesters — on average — took an extra month to fish. That was a surprise, says Andrew Rosenberg, director of the Center for Science and Democracy at the Union of Concerned Scientists. "When you think about it, a month [longer] means fishermen made decisions about not fishing in bad weather and took their trips when it was safer. That probably meant it saved lives and reduced injuries," says Rosenberg, a former deputy director of the National Marine Fisheries Service. He wrote a commentary on the findings also appearing in Nature. Indeed, other studies have found that catch share programs do reduce risky behavior by fishermen. And slower fishing has benefits for consumers, too: Some of the seafood we like best can be found fresh more frequently at seafood counters. "For example, the Pacific halibut fishery used to operate under an extreme derby. It was caught in a matter of days and had to be frozen," says Smith. "Now fishing time is stretched out to most of the year. That means you now have a product that's available fresh much of the year, that simply wasn't before." Despite the benefits, catch shares can be incredibly controversial. Opponents argue that such programs essentially privatize a shared public resource. They say it forces consolidation of the fishing fleet; pushes smaller fishermen out of business; prompts worries over non-local ownership of fishing quotas; and can negatively impact fishing communities. Right now, opponents in North Carolina are fighting to keep catch shares out of their region. Last week, state Sen. Bill Rabon introduced legislation opposing the introduction of catch share programs. In March, South Carolina lawmakers adopted a resolution opposing catch shares in their region as well. But Doug Rader, chief oceans scientist with EDF and a proponent of catch shares, says the timing of today's paper is critical. "This paper provides compelling evidence that when it comes to fisheries, the U.S. is on the right course. Fish populations are the best they've ever been and rates of overfishing have come down, in part, due to catch shares and other programs like it," he says. U.S. lawmakers are currently considering whether to reauthorize the Magnuson-Stevens Fishery Conservation and Management Act, which governs U.S. fisheries and has been credited with reducing overfishing. But a bill introduced in February by Rep. Don Young (R-AK) could make it harder for some regions to adopt new catch share programs or expand existing ones. "Political micromanagement of these things is not a good thing," says Rosenberg. "Then it's political influence at the national level versus work-it-out at the local level," he says. "This study isn't the last word on catch shares, but is another useful piece of information" about what happens when they're in place.